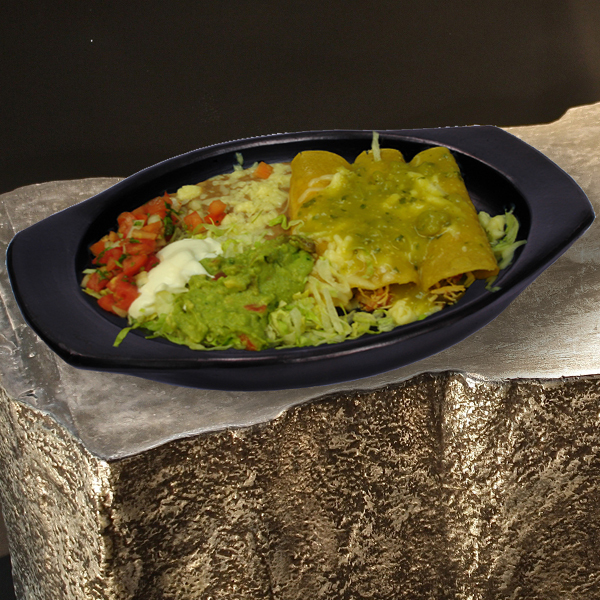 These oval plates have extra room for serving larger portions or multiple items, and essential for Bandeja Paisa! Their stark black color provides a stunning back drop for any dish. Since they are oven proof, they can also be used for roasting or melting cheese prior to service. The smaller version allows for portion control and smaller serving sizes. Black Clay Cookware is not only beautiful, but it is also quite sturdy and will last many years with proper use and care. The pieces can be used in the oven, in the microwave or a stovetop, and can go directly to the table for a sophisticated presentation. The pieces can be used directly on a gas or electric range, however, it is recommended to use a heat diffuser on electric ranges. The heat diffuser (which can be used with gas stove as well) has the added benefit of distributing the heat slowly to prevent foods from burning. Clay cookware can also be used on induction cooktops with the use of an induction cookware interface disk. Before a Black Clay, La Chamba Piece is used for cooking the first time; it should be “cured” to seal the pores. Most pieces, since made with the best quality clay, will likely not need curing and can be used after light wash and slowly boiling some water, however, It is still a good idea to seal and cure the piece. Every culture has different methods of sealing and curing their clay cookware. The most traditional method used in Colombia is to warm the clay piece slightly, then thoroughly rub the inside with a ripe plantain (a regular banana will do), leaving a thick coating on the clay. After drying for a bit, the piece can then be lightly washed to remove the residue. The sealing can also be done with almost any oil, or even as easily as filling the piece with a mixture of milk and water and boiling it for a few minutes. During the boiling, some seepage may occur which is quite normal, however, the boiling action will eventually seal the pores. Finally, to cure the piece, start sautéing some onions or garlic with a little oil or butter. This will finish the process and you are then ready to begin cooking. I cheat on this recipe. Sure I can tell you how to perfectly roast a chicken, or give you the instructions on how to boil chicken breasts with vegetables and spice, giving you the added chicken stock as a byproduct which you can use for another purpose, however, I find it is better to buy store bought rotisserie chicken. Not only does it give you great tasting dish, but you can spend the extra time on the sauce which is the most important part of the dish.